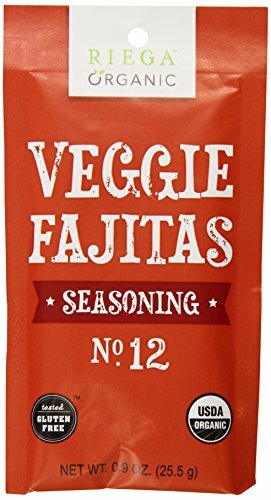 Riega Foods Organic Veggie Fajita Seasoning contains organic paprika, organic garlic, organic onion, sea salt, organic black pepper, organic cane sugar, organic oregano, organic chili pepper, organic cumin and organic cayenne pepper. It is QAI Organic certified, Kosher certified, Vegan certified and packaged in a dedicated gluten-free facility. Our products are found in local health food markets, specialty retailers and national grocery chains throughout the United States. Riega Foods Organic seasonings are made without fillers, preservatives or processing aids of any kind. We use only 100% herbs and spices! If you have any questions about this product by Riega, contact us by completing and submitting the form below. If you are looking for a specif part number, please include it with your message.